Earlier this winter Friends of Terwilliger board member Wesley Risher wrote to the City of Portland’s Urban Forestry to find out how to replace the dead Douglas-fir tree (Pseudotsuga Menziesii) planted as part of BES’ SW Vincent Place/SW Capitol Hwy Sewer Replacement Project. The Douglas-fir, within the right-of-way at SW Capitol Hwy and SW Terwilliger Blvd, had clearly died and was in need of replacement. Urban Forestry was initially contacted; the request then routed to Bureau of Environmental Services (BES) for review of their 2012 project landscape mitigation plantings. It was discovered that several other native plantings in the area were at risk prompting BES to tag the plantings for future protection. The tree has since been re-planted. Many of the maintenance actions by the City of Portland are complaint driven. This means the city needs to hear from you/us. 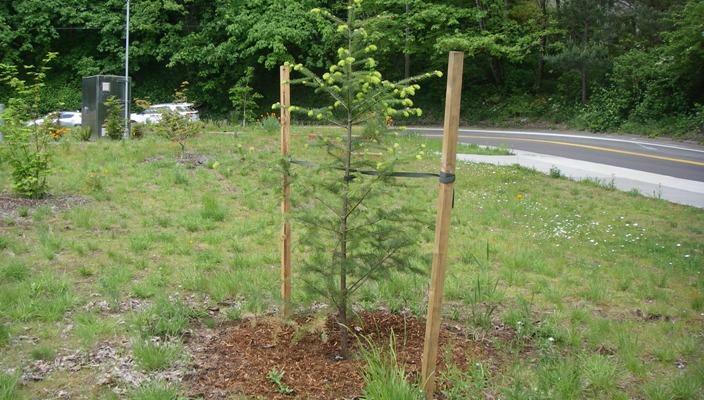 The replanting of this Douglas-fir is a good example of the value of friends groups like the Friend of Terwilliger, who advocate for Terwilliger Parkway, to benefit all park users. Please stop by to look and appreciate the new addition to the Parkway.